In so many areas, governments represent our best hope for making the broad-based societal changes that philanthropic organizations are devoted to bringing about. Governments have the authority to drive change in ways that philanthropic organizations cannot. By leveraging our resources, and forming partnerships with government, philanthropic organizations can help push those changes forward. That mindset may be untraditional, but it is at the heart of nearly everything Bloomberg Philanthropies does. I have been lucky to see this issue from the other side. Serving for 12 years as mayor of New York City gave me a special appreciation for government’s ability to be a force for good and a catalyst for global change. For instance, my first big contribution to the fight against tobacco was not a check that I wrote but a bill that I signed. The law that we adopted in New York City banning smoking in bars, restaurants, and all indoor workplaces set in motion a wave of change that has spread around the world. Nations in South America and Europe – where smoking was such an ingrained part of the culture – adopted similar laws, as did states around the U.S. By proving that the law could work in New York City, we helped start a global movement. At Bloomberg Philanthropies, we’re adding momentum to that movement by focusing much of our tobacco work on government advocacy. We support groups that are pushing their governments to adopt tobacco control measures that are proven to have an impact, such as tobacco tax increases, graphic health warnings on tobacco products, and smoke-free laws. In 2014, this approach helped achieve some important victories. For instance, we supported successful efforts to pass a smoke-free law in Beijing, which we hope will pave the way for a national smoke-free law in China. In India, the government began requiring some of the world’s largest health warnings on tobacco packaging. We are also pushing for governments to address climate change. The world faces dangerous risks from warming temperatures, rising sea levels, and intensifying storms. Solutions depend on global cooperation. While an international treaty has thus far been elusive, cities – where 70 percent of the world’s emissions originate – have been making great strides. To help accelerate that work, we have strongly supported the C40 Cities Climate Leadership Group, which provides a forum for 75 of the world’s largest cities to discuss strategies for addressing climate change. It also serves as a platform to help mayors convince their national governments to set more ambitious climate action goals. As the UN Secretary-General’s Special Envoy for Cities and Climate Change, I have been encouraged to see national governments increasingly recognize that cities can help accelerate their carbon reduction efforts. Here in the U.S., we have formed a partnership with the Sierra Club to move our nation Beyond Coal. Together, we help mobilize communities to replace coal power plants with cleaner forms of energy production. Coal plants are the single largest source of carbon pollution in the U.S., and they take an enormous toll on public health. Since we began working together, more than 180 coal plants have either closed or committed to closing. That achievement is a major reason why the U.S. has led the world in reducing its carbon footprint in recent years, and it has helped reduce the number of annual deaths caused by coal pollution from 13,000 to about 7,500. Advocacy like this is essential, because even when government leaders believe in the need for action, they often wait for the public to act first. With political capital always at a premium, elected officials tend to pick their battles. Philanthropy can help nudge them into the toughest battles by showing that they’re winnable. One of those battles concerns obesity, which has rapidly become one of the leading causes of death – and not just in the United States. Mexico has one of the world’s highest obesity rates, and it’s no coincidence that it also has one of the highest rates of soda consumption, a leading contributor to obesity. To help save lives in Mexico and reduce the stress on its health care system, we supported local advocates who led a campaign for a national tax on sugary drinks. They succeeded in 2013, convincing a majority of the Mexican Congress to vote for the tax, despite a well-financed attack campaign funded by the soda industry. Since then, we’ve been working with partners in Mexico to measure the law’s impact. Preliminary data shows that soda consumption is falling, partly because prices are higher, but also because public awareness of the health dangers has increased. If that trend continues, not only will it make a big difference in Mexico, it will give public health supporters in other countries the evidence they need to push their governments to adopt similar policies. In November 2014, voters in Berkeley, California passed an initiative creating the first soda tax in the U.S. – a campaign I contributed to personally. Advocacy is not the only way to spur public sector change. In many cases, government leaders are eager to test out new policies and programs but cannot justify spending scarce resources on unproven ideas. Citizens rightly expect their representatives to be careful stewards of their tax dollars, which is one reason why risk-taking is harder in the public sector than it is in the private sector. But without experimentation there is no innovation, and without innovation, there is just stagnation. I know from talking with mayors around the world that they have an enormous appetite for new experiments, but often don’t have the funds or capacity to undertake them. Philanthropy can help bridge the gap between ambition and implementation. In 2012, we created a competition called the Mayors Challenge, which invites cities to develop creative experiments aimed at addressing their most pressing problems. It proved to be a big success, and so last year we expanded it to Europe, where we received an overwhelming response: More than 150 cities in 28 nations submitted proposals. We awarded the five winning cities a total of €9 million. Not every idea may work, but those that do will spread, producing positive change on a scale that would otherwise be beyond the reach of philanthropy. While the Mayors Challenge incentivizes innovative ideas, another program we began – called Innovation Teams – helps implement them. In New Orleans, for instance, the Innovation Team that we funded and Mayor Mitch Landrieu hired, focused on reducing the city’s murder rate. Last year, New Orleans’s murder rate hit a record low. Our grant to the city was $4 million over four years. We could not possibly have helped save as many lives if we had directed that money away from city government. We also fund innovation by encouraging governments to embrace and support the arts. With these governments struggling to meet so many pressing needs, the arts often don’t receive the funding they should, even though they are an essential component of economic development and job creation. In New York’s City Hall, our support for the arts not only helped us increase tourism by 40 percent, which benefitted many different industries, it also helped make the city a more attractive place for companies to invest. People want to live and work in places that have vibrant arts communities, and public art is the most visible and accessible expression of a city’s interest in the arts. This year, to encourage more cities to embrace public art, we invited city governments across the U.S. to propose projects that engage people and strengthen communities. There is no shortage of government leaders who are seeking help in taking on additional challenges. A year ago, we formed Bloomberg Associates, which is essentially a free consulting firm available to cities. It’s composed of former members of our administration who had phenomenal success in city government and earned international reputations for their work. Demand for their services has been extraordinary, and they have taken on a roster of clients – from Kansas City to Mexico City – that continues to grow. They work closely with mayors and their staffs, offering the guidance, support, and data that can help cities implement and institutionalize new policies and programs. Empowering individuals and communities to take charge of their futures has always been a focus of philanthropy, and we can be much more successful when that work is aligned with the goals of governments. Our women’s economic empowerment program in Africa is a good example of why that’s true. We have worked closely with the governments of Rwanda and the Democratic Republic of Congo to create job training programs in industries that are central to their national economic development goals. By working within a government’s economic agenda, we are helping to ensure that those who are most in need of economic opportunity – in this case, women in post-conflict zones and their families – share in the benefits of growth. Whether in Africa or here at home, education is the key that opens the door of opportunity. This year we launched a new education initiative that is designed to help more high-achieving high school students from low- and middle-income families apply to top colleges and universities. Currently, too many do not, even though they have the grades to get in and succeed. The initiative provides one-on-one virtual advising to students so they can find the best school for them and secure the financial assistance they need to attend. We’ve also put together a diverse group of college leaders and experts to figure out ways that the top schools can accept more of these students. We are committed to working with partners inside and outside government who are positioned to help us fulfill our mission: ensuring better, longer lives for the greatest number of people. In 2014, we found new opportunities to advance this mission in all five of our major areas of focus, and it was exciting to see some of that work firsthand. After serving 12 years in City Hall, last year I was able to spend more time on philanthropy. This year has brought more change for me, as I’ve reassumed full-time leadership of the company I founded 34 years ago, Bloomberg LP. But the constant throughout my career has always been – and always will be – philanthropy. 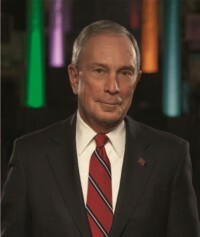 In 2015, I will remain as involved as ever in the growing work of Bloomberg Philanthropies, and I’m looking forward to building new partnerships with leaders around the world – in government, philanthropy, and business – who share our goals.